A very interesting, but very preliminary study just came out about breast cancer and walnuts. Could follow up research really show this to be true - that eating walnuts has an anti-breast cancer effect?? Animal studies find that multiple ingredients in walnuts (e.g.alpha linolenic acid, beta-sitosterol, a number of antioxidants such as ellagic acid) reduce the risk of cancer or slow its growth, or even increase tumor cell death. Researchers think this is true for human breast cancer also, and so a study was done looking at "gene expression" of breast cancer tumors. The question asked by the Marshall University (West Virginia) researchers was: Would eating 2 oz (14 halves) of walnuts daily for 2 to 3 weeks have an effect on the breast cancer tumors? 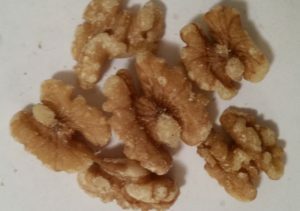 10 post-menopausal women had diagnostic breast cancer tumor biopsies done and then were randomly divided into 2 groups: 1) 5 of the women ate 2 oz of walnuts daily for the 2 to 3 weeks until breast cancer surgery, and 2) the other 5 avoided eating walnuts in the 2 to 3 weeks prior to breast cancer surgery. Otherwise the women ate their normal diets - a Western style diet. The researchers noted that in the walnut eating group: "gene expression in the tumor was modified in ways expected to slow proliferation, reduce inflammation, reduce metastasis and to increase cancer cell death". The researchers also felt that consuming walnuts would decrease risk for cancer recurrence, and that there may be benefit from walnuts against many cancer types. The researchers point out that another study published in 2016 (which was a review and analysis of 20 studies) concluded that "nut consumption, including peanuts, was associated with reduced risk of cancer and reduced all-cause mortality" (meaning death from any cause) - which agrees with the results of this study. In the 2016 study the beneficial health effect was for at least 28 grams (1 serving) of nuts per day. Bottom line: Enjoy consuming some nuts daily! Previous article:What’s Getting Into You From Vinyl Flooring?